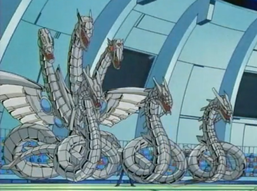 "Cyber End Dragon" and three "Cyber Dragons". "Cyber Dragon" (サイバー・ドラゴン Saibā Doragon) is an archetype of cards that are also part of the "Cyber" archetype. They are a group of Machine monsters, most of which are LIGHT, used by Zane Truesdale, then later by Syrus Truesdale in the Yu-Gi-Oh! GX anime and manga. "Cyber Dragon" and its upgraded forms, serve as a spiritual successor towards the "Blue-Eyes" cards. The OCG structure Deck Structure Deck: Blitzkrieg of the Mechlight Dragons and the TCG structure Deck Cyber Dragon Revolution Structure Deck center around this archetype. "Chimeratech" monsters are related to, but not part of, the "Cyber Dragon" archetype, being composed of DARK, Machine-Type Fusion Monsters. All "Chimeratech" monsters require multiple Fusion Material Monsters. In the case of "Chimeratech Overdragon" and "Chimeratech Fortress Dragon" , one of the Material Monsters must be a "Cyber Dragon", whereas "Chimeratech Megafleet Dragon" requires one of the Material Monsters to be a "Cyber Dragon" monster. "Chimeratech Rampage Dragon", on the other hand, requires two or more "Cyber Dragon" monsters for its Fusion Summon. The ATK and DEF of "Chimeratech Overdragon", "Chimeratech Fortress Dragon" and "Chimeratech Megafleet Dragon" is a variable multiplied by the number of monsters used in its Fusion Summon, which can be as high as the user wants, being x800, x1000 and x1200, respectively. "Rampage Dragon" is the only one whose ATK does not change, instead being able to destroy as many Spell or Trap Cards as materials used for its Fusion Summon. "Cyber Dragon" appear as a character in Yu-Gi-Oh! Ultimate Masters: World Championship Tournament 2006, 2009, 2010 and Duel Arena. The main strategy for these cards is to Summon the stronger "Cyber Dragon" Fusion Monsters. When building a Deck around these cards use strong Machine-Type monster cards to help keep the field clear and to unleash the devastating powers of the "Chimeratech" cards. Union monsters, like "Heavy Mech Support Platform" and "Armored Cybern", can help with supporting monsters already on the field. A quick way of swarming the field is by Special Summoning "Proto-Cyber Dragon" with "Photon Lead", then activating "Inferno Reckless Summon" and Special Summoning all "Cyber Dragons" from the hand, Deck and Graveyard, resulting in a massive field advantage and the ability to perform Xyz and/or Fusion Summons. "Honest" is ideal to support the LIGHT monsters. "Jinzo" can negate all Trap Cards or "Cyber Phoenix" to negate Spells and Traps that target Machines on the field providing protection to Special Summon "Cyber Twin Dragon" without worrying about your opponent traps or spells, while providing more Fusion Material for the "Chimeratech" Dragons. The ABC Union monsters ("A-Assault Core", "B-Buster Drake", and "C-Crush Wyvern") can also support this archetype well, as the majority of its members are LIGHT Machine-Type monsters, by making them immune to all of the opponent's card effects and save them from any form of destruction. "Torque Tune Gear" can stop your opponent from using effects that target your monsters, and also open upon potential for Synchro Summons in the archetype, which was not possible in the past. "Limiter Removal" can be used in place of an "Honest", as it affects all Machines, though with the fatal drawback of destroying all your Machines at the end of the turn. This can be avoided, however, with the ABC Union monsters or "Torque Tune Gear". "DNA Surgery" is also a good card to include, since it allows you to use your opponent's monsters for "Chimeratech Fortress Dragon" as well as clearing your opponent's field for an easy OTK. There are times when "Chimeratech Overdragon" can be removed from the field as soon as its Summoned by means of "Bottomless Trap Hole", "Solemn Warning", and "Torrential Tribute". When you have LIGHT Attribute Machine-Type Monsters on your field, they can also be used as Summon requirements for "Cyber Eltanin" by just banishing them. Not only will "Cyber Eltanin" have high ATK, but once its Summoned to the field it also clears it of any other monsters, leaving your opponent open to a direct attack. A quick combo is to use the "Gadgets" to bring Machine-Types to your hand so you can fuse them with "Cyber Dragon" to create "Chimeratech Overdragon". The support released in the Cyber Dragon Revolution Structure Deck relies on swarming the field with "Cyber Network" and manipulating the level of the "Cyber Dragon" monsters with "Cyber Dragon Drei" to Xyz Summon "Cyber Dragon Nova", and by extension, "Cyber Dragon Infinity". You can combine "Cyber Network" with "Cyber Dragon Nova" to retrieve all "Cyber Dragons" banished by their effects and maintain a huge field presence. "Cyber Repair Plant" can be used to give fuel to "Cyber Dragon Nova" as it searches a "Cyber Dragon" for you to banish as cost for its effect, but can also be useful to perform the well-known Special Summon of "Cyber Dragon", if you control no monsters while your opponent does. "Transmodify" can be useful as it allows you to tribute a "Cyber Dragon Zwei" or "Cyber Dragon Drei" to Special Summon a "Cyber Dragon" or "Galaxy Soldier" from the Deck and perform the Xyz Summon of "Cyber Dragon Nova" if you have another level 5 "Cyber Dragon" monster out already. Using "Foolish Burial" to send "Cyber Dragon Core" from your Deck to the Graveyard, you will have conditions to quickly Special Summon any "Cyber Dragon" monster directly from the Deck. Another smart use for this monster, once it is treated as "Cyber Dragon" while on the field or in the Graveyard, is to banish it to boost the ATK of "Cyber Dragon Nova" via its own effect, so this can be useful if its first effect was used and you don't want to leave it exposed on the field with its low ATK. If you have "Cyber Dragon Core" on the field, "Machine Duplication" will Special Summon two copies of "Cyber Dragons" directly from the deck. This can lead to an immediate "Cyber Dragon Nova". Furthermore, with "Limiter Removal", you can have an 8400 ATK monster when combined with the effect of "Nova" (by banishing "Core"). Or, instead of summoning Nova, if you have "Power Bond", you can use it to summon "Cyber End Dragon" with 8000 ATK (or 16000 ATK, if you used "Limiter Removal"). This Deck variant focuses more on Rank 5 and control tactics rather than beatdown. For this build, ideal cards are the likes of "Artifact Moralltach" and "Artifact Sanctum", which are easily splashed in the deck. Since most Cyber Dragon Decks are focused on beatdown, both "Moralltach" and "Sanctum" provide an element of surprise over the opponent since both cards can potentially destroy the opponent's cards, as well as providing Rank 5 material and a solid beater. Due to the nature of both cards, the opponent may be reluctant to destroy your Spell/Trap cards, giving more freedom to the Cyber Dragon player to summon monsters. Another useful pair of monsters is Chronomaly Golden Jet and Galaxy Soldier. Due to both being LIGHT Machine-Type Monsters, they can be searched by Cyber Repair Plant. Because "Galaxy Soldier" is Summoned by discard LIGHT monsters, you will be able to fill your Graveyard up quickly to fuel both effects of "Repair Plant", as well as quickly Summon "Cyber Dragon Nova" or "Infinity". A good combo is to Normal Summon Cyber Dragon Core, then use its first effect to search "Repair Plant", then let "Core" be destroyed, then the following turn use "Repair Plant" to search "Golden Jet" and banish "Core" to Special Summon "Cyber Dragon" via its second effect. Finally, Normal Summon "Golden Jet" and using its effect to access nearly every Rank 5 monster (excluding C monsters) including the powerful Constellar Pleiades. "Cyber Dragon Drei" can also achieve this, but due to its restrictions, it can only do so after the turn it uses its first effect. Another option is Star Drawing, as it can allow the player to Draw a card after being used as Xyz Material, however it cannot be searched by "Repair Plant" nor can Xyz Summon "Pleiades" or "Cyber Dragon Nova" making it rather impractical. Even Rank 5 Decks can enjoy very powerful offense, largely due to both Cyber Dragon Infinity being easily Summoned through "Nova", and "Chimeratech Rampage Dragon", as well as techs like Instant Fusion to Summon the Level 5 Panzer Dragon or "Rampage Dragon", allowing another option for performing Rank 5 Xyz Summons without the need for "Drei", who will limit you to only Summon Machine-Type monsters. A good play is to Xyz Summon "Nova" through Cyber Dragon and another monster (such as "Drei" or "Golden Jet"), then use the effect of "Nova" to Special Summon "Cyber Dragon" and then use "Instant Fusion" to Special Summon "Panzer Dragon", then you can Xyz Summon into another Nova by using "Panzer Dragon" and the previously summoned "Cyber Dragon" and use its effect to Special Summon "Cyber Dragon" once more before ranking-up into "Cyber Dragon Infinity", then if the opponent has a single monster in attack position, you can use "Infinity's" effect to attach it to itself as an Xyz Material. Finally, if field is open to attack directly, attack with "Cyber Dragon", "Cyber Dragon Infinity" and "Cyber Dragon Nova" (who should attack last to make sure "Cyber Dragon" attacks before it and then banish that monster to boost "Nova's" ATK), potentially dealing over 8000 damage, and thanks to "Infinity's" negation effect the opponent is left with little room to stop the ensuing offensive. "Rampage Dragon" can send "Cyber Dragon Core" or "Electromagnetic Turtle" to your Graveyard for strategic purposes. As such, it is also a good idea to run cards like "Power Bond" or "Overload Fusion", since "Rampage Dragon" needs 2 or more "Cyber Dragon monsters" unlike "Overdragon" and "Fortress Dragon" that strictly require "Cyber Dragon", thus getting the materials is easily done through "Core" via its banishing effect and the "Repair Plant" it can search via its first effect. If Fusion Summoned, "Rampage Dragon" can destroy at least 2 Spell or Trap cards, thus destroying possible resistance. Furthermore, if summoned through "Power Bond", its doubled ATK combined with its ability to gain an additional attack per monster sent from your Deck to the Graveyard (max 2) once per turn can inflict a devastating amount of damage. If the opponent controls only a single monster, weak monsters or no monster at all, "Rampage Dragon" can OTK the opponent on the spot after attacking three times. Even if you are unable to finish off the opponent with its attacks, its dumping effect can still be put to strategic use for Xyz plays by sending cards like "Core", to eventually fuel Rank 5 plays, or "Cyber Dragon" itself, combining with the likes of "Call of the Haunted". Overall this variant can be played much more offensively, by making use of different cards to ensure more reliable and safer plays, since both "Cyber Dragon Infinity" and "Chimeratech Rampage Dragon" provide a level of protection to the Deck by destroying or negating potential threats, thus there is no real loss of defense. It trades the high ATK power of the OTK variant in exchange for control power, having a balance between offense and defense while being capable of Summoning powerful monsters with relative ease, for nearly any situation. This variant can make use of massive swarm and offensive ability. The "Kaiju" archetype and ABC Union monsters can work well with this variant of Cyber Dragon. If your opponent is on the defensive, you can Tribute their monsters to Summon "Kaiju" monsters such as "Jizukiru, the Star Destroying Kaiju", then immediately take it back with "Cyber Dragon Infinity" or "Chimeratech Fortress Dragon". Kaiju monsters also open up the possibility for Rank 8 plays in Cyber Dragon decks, by using "Interrupted Kaiju Slumber" while you control no monsters, then Summoning "Cyber Dragon Drei", "Zwei", or "Core" to immediately summon "Chimeratech Fortress Dragon" using it and the copy of "Jizukiru" you Summoned with "Interrupted Kaiju Slumber" to then using them both to Xyz Summon "Number 38: Hope Harbinger Dragon Titanic Galaxy" or "Divine Dragon Knight Felgrand" to provide another layer of protect for monsters, like "Cyber Dragon Infinity", which "Number 38" can redirect attacks away from and "Felgrand" can make immune to card effects. As most of the Cyber Dragons are LIGHT Machine-Type monsters (excluding "Chimeratech" monsters, as they are DARK instead), the "Ally of Justice" monsters (especially monsters such as "Ally of Justice Core Destroyer" and "Ally of Justice Catastor") will kill them instantly. Cards such as "Magnetic Mosquito" and "System Down" also hurt them (especially System Down, as it banishes Machines), and are the most common, exploitable, and obvious countermeasures to this deck since "System Down" can eliminate the presence of all Machine-Type monsters on the field as well as those in the Graveyard (which the "Cyber Dragon" archetype is heavily reliant on as most monsters within it allow them to share its name). "Karma Cut" has also been shown to be a very good countermeasure to the deck as it can easily eliminate every monster that shares the name of "Cyber Dragon" and is more splashable against common deck types such as Zombie and Harpies. Another option is "Electric Virus" which, while uncommon, can allow the user to prevent a potential OTK from the common Extra Deck monsters within the Deck. Although both "System Down" and "Karma Cut" can be mitigated by the effect of "Cyber Network" or "Imperial Iron Wall", or you can use "Infinity" to negate the activation of these cards. However, due to the existence of "Chimeratech Fortress Dragon" that can employ a "Cyber Dragon" and Machine-Type monsters from anywhere on the field, Cyber Dragon monsters are ironically their own worst enemy, and even a good field can be reduced to nothing and provide the opponent's "Fortress Dragon" with massive attack depending on the number of monsters employed. Due to the nature of its Special Summon procedure, not even "Infinity" can prevent it, thus making it a major threat for any Machine Deck. This page was last edited on 6 January 2019, at 04:33.